Louie Anderson Coming To Folsom! His career has spanned more than 30 years. He is a best-selling author, star of his own standup specials and sitcoms, and he continues to tour the country performing to standing room only crowds worldwide. In 2016, Louie was cast to co-star along with Zach Galifianakis and Martha Kelly in the hit FX series, “Baskets.” Anderson’s extraordinary new role is Christine Baskets, the matriarch of the Baskets clan. The character is based on both his mother and his five sisters, who were a major presence in his life. “I’m not as nice in the character as my mom was as a person. Johnny Carson, the comedy icon for generations of rising stars, invited Louie to make his national television debut on the “The Tonight Show” in 1984, and the rest is history. Leno, Letterman, The Late Late Show with Craig Ferguson, “Comic Relief” and Showtime, HBO and CMT specials followed, including hosting the legendary game show, Family Feud, making Louie a household name and opening doors for him as an actor. In 2013, he took a dive on the ABC reality series, “Splash” where he conquered his own fears while becoming an inspiration of hope. His standup Special, “Big Baby Boomer” premiered on CMT, in 2013. Also in that year, he competed and inspired on the ABC reality competition show, Splash. 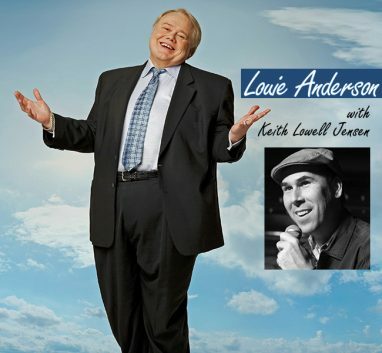 In 1995 Louie put his creative energies to work on the Saturday morning animated series “Life with Louie.” The longrunning series based on Louie’s own childhood and his life with his father won three Humanitas Prizes for writing on a children’s’ animated series, making him the only three-time recipient of this award. It also earned a Genesis Award for its depiction of the proper treatment of animals and, most significantly, two Emmy Awards. His best-selling books include Dear Dad – Letters From An Adult Child, a collection of alternately touching and outrageous letters from Louie to his late father, and Good-bye Jumbo…Hello Cruel World, self-help for those who struggle with self-esteem issues, and his latest installment on family, The F Word, How To Survive Your Family. Anderson will appear at Folsom's Harris Center for the Arts, one night only, on Thursday April 6. Opening will be Keith Lowell Jensen. Jensen has become known for his subtle, smart approach, and his meandering story telling. He has appeared on The History Channel, Spike TV, and The Starz Network. His latest special, Atheist Christmas, appeared on Hulu.